The Community Relations Committee provides opportunities for TTCC members to volunteer with local not-for-profit organizations needing project assistance, and is also a way for Chamber members to engage in community events. The Chamber’s Community Relations Committee (CRC) demonstrates strong community service and spirit. The CRC strives to foster good community relations among Chamber members while celebrating the rich histories of Foxborough, Mansfield, and Norton. If you are interested in becoming more involved with Community Relations as a Chamber member, please contact the Chamber. 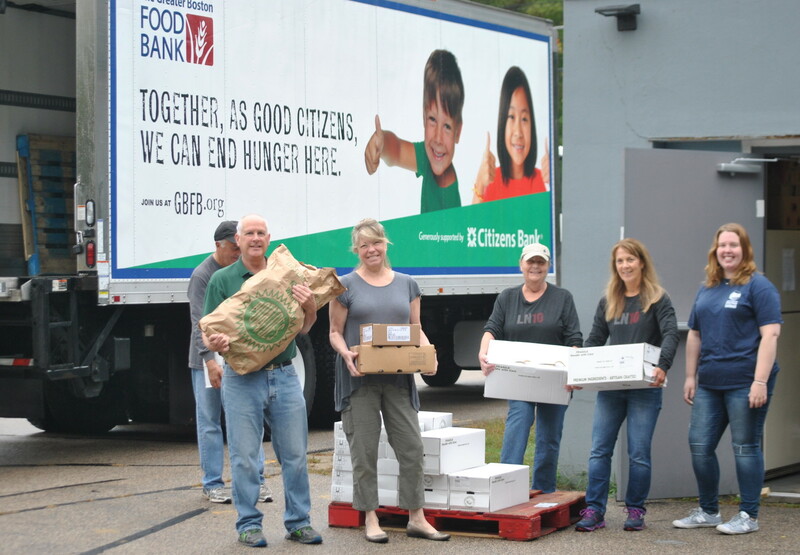 Unload Truck & Stock Shelves: Tuesday, March 27th, April 24th, May 22nd, June 26th (9-10 AM) Help us unload our large monthly order from the Greater Boston Food Bank. Unpack items and re-stock the shelves. We need 5-6 people each month. Distribution: Monday, March 5th & 19th; April 2nd & 16th; May 7th & 21st; June 4th & 18th (4:30-6:30 PM) Help our pantry families shop for food from our shelves, and bring their bags out to their cars. We need 5-7 people on those nights, and just a one hour commitment is fine. 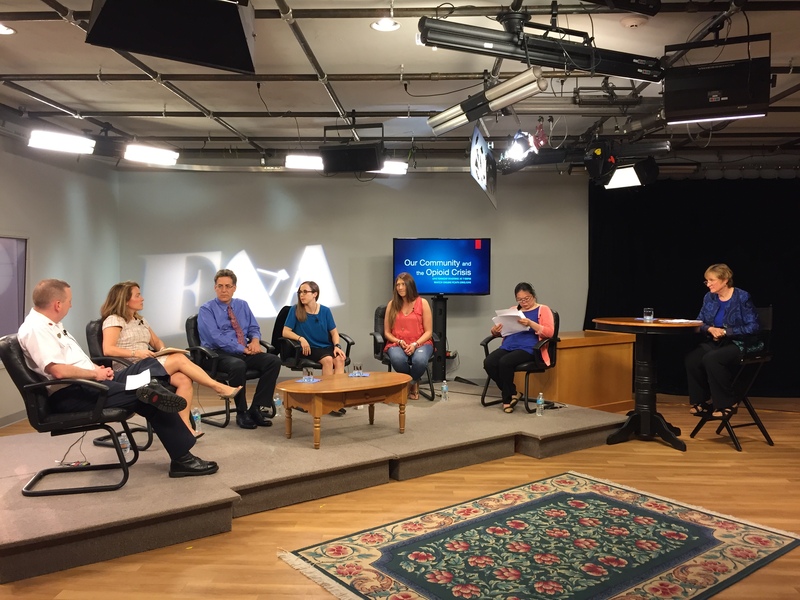 With the support of Foxborough Human Services and Brigham and Women’s/Mass General Health Care Center, the Tri-Town Chamber of Commerce is making available the following television broadcast, via YouTube, in order to educate colleagues, family, and friends affected by the opioid crisis. Originally broadcast in May, and now available on YouTube, over 500 people have already viewed this show, which follows the path into and then out of substance use by a patient in recovery. Adding to that patient’s story are a panel of experts, who identify a wide variety of resources available for people coping with a substance use disorder. Photo caption: Panelists, L-R: Foxborough Deputy Fire Chief Mike Kelliher, Assistant District Attorney Jen Rowe, Esq. ; Brigham and Women’s Primary Care Foxborough Medical Director David Faling, MD; Brigham and Women’s Psychiatry Addiction Services Resident Claire Twark, MD; Patient in recovery Stephanie Scena; Riverside Emergency Services Program Director Wenhui Yang; and Foxborough Human Services Executive Director Vicki Lowe (Moderator). 2016 Chamber Members have come together to help the Norton Cupboard for Kindness. Volunteers unpacked palettes of food and restocked the shelves! Joe Mc Farland of Statera Financial Group, as well as the team of Mike Murphy, Beth Seekins, Melissa Houghton, Kim Smelstor, and Debbi Daitch of Brigham and Women’s/Mass General Health Care Center in Foxborough at Patriot Place. 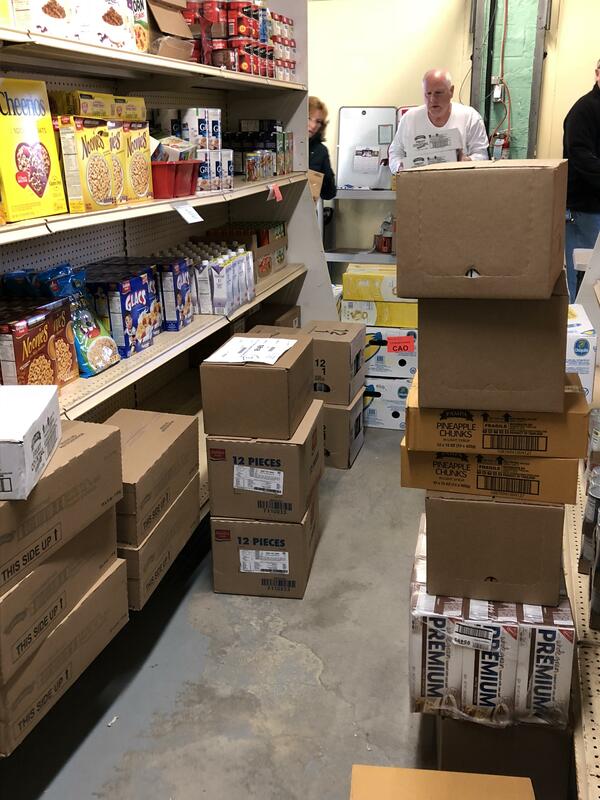 North Easton Savings Bank Employees unpacked and stocked the shelves! The crew from Patriot Place in Foxboro (Erick, Brandon Lucia, Diana and Brittany) made an enormous difference in getting their monthly delivery boxes together quickly and efficiently! The Community Relations Committee, supports many local non-profits over the course of the year. For 2015 their main focus will be on 2 local groups to assist them in getting their mission more publicized. On Tuesday, March 10, an impressive number of Tri-Town Chamber member businesses leant their time and expertise to the annual School-to-Career Partnership’s “Credit for Life” event at Wheaton College. High school seniors from Attleboro, Foxborough, North Attleboro, and Norton – 400 in total – attended this financial literacy event. Special thanks to Foxborough High School’s Guidance Department staff, as well as to the Tri-Town Chamber businesses. 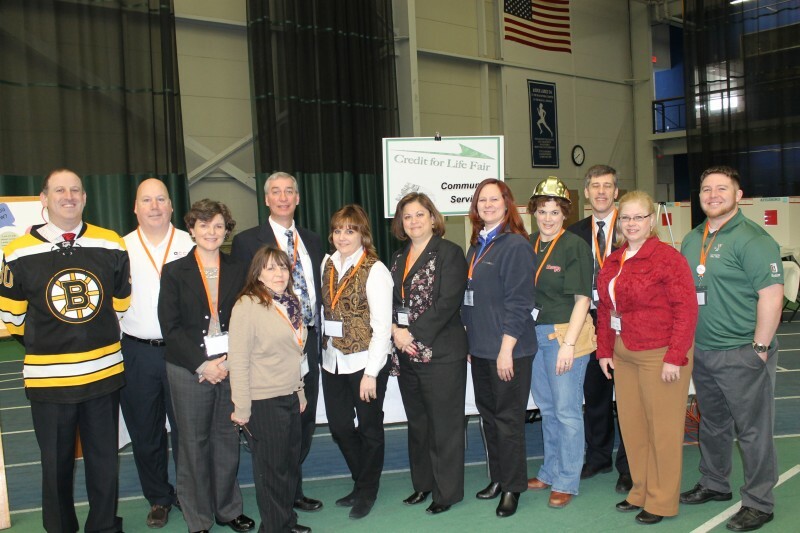 Photo caption: The Tri-Town Chamber of Commerce was out in force on March 10, supporting Foxborough High School and three other area schools by working with high school seniors on financial literacy at the annual “Credit for Life” event. Pictured, left to right: Brad Greenstein (North Easton Savings Bank); Michael Edgar (American Credit Counseling Services); Cindy Peterson (Brigham and Women’s/Mass General Health Care Center); Bettie Howarth (American Credit Counseling Services); Jeff Elofson (Sharon Credit Union); Lori Rudd (Re/Max); Carie Bailey (Mansfield Bank); Katherine Light (HarborOne Bank); Linda Corey (North Easton Savings Bank); Dave Santoro (MCB Financial Services); Beth Santella (North Easton Savings Bank); and Danny Demars (Hockomock YMCA – Foxborough). -- Photo by Ellen Pillsbury, FHS Guidance Dept. 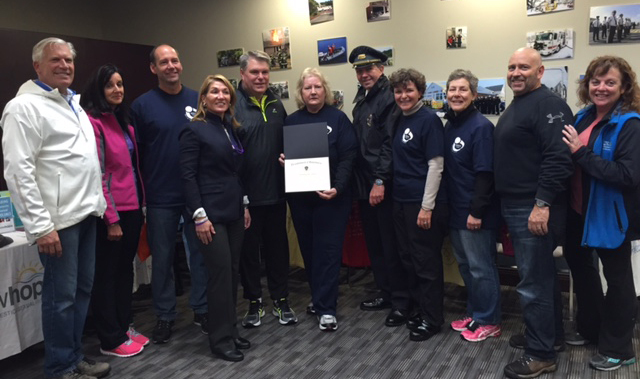 Oct 2015 HUGS-Foxboro's 10th Annual Walk & Family Fun Day: Rep. Jay Barrows, Fxb Assistant Town Manager Mary Beth Bernard, Chair-Fxb Board of Sekectmen, Lt Gov Karyn Polito, Fxb Town Mgr Bill Keegan, HUGS President Maura Schaeffer, Fxb Police Chief Ed O'Leary (HUGS Board), Brigham and Womens/Mass General Health Care Center Director Cindy Peterson (HUGS Board), Ruth Karacek (HUGS Board), Joe Sheehan (HUGS Board), and Tri-Town Chamber's Kara Griffin. The Tri-Town Chamber of Commerce’s “Women’s Link” group recently sponsored an educational session in recognition of sexual assault awareness month (April). This Self Defense Seminar was led by Chris Rappold of Personal Best Karate (pictured, second from right) in their Norton studio. The session boasted an excellent turnout for this early-morning session; attendees were professional women from the Mansfield, Norton, and Foxborough area. Tri-Town Chamber of Commerce VP of Community Relations Cindy Peterson of Brigham and Women’s/Mass General Health Care Center reported that the Chamber’s Women’s Link group conceived of this community event to raise awareness around sexual assault as well as to give back to community groups whose mission is to educate around violence prevention: Help Us Get Safe (HUGS)-Foxboro, and New Hope. Personal Best donated the session, and participants made a donation to HUGS or New Hope, raising nearly $250 which has been shared between HUGS and New Hope. Cindy Peterson pleased with her work! 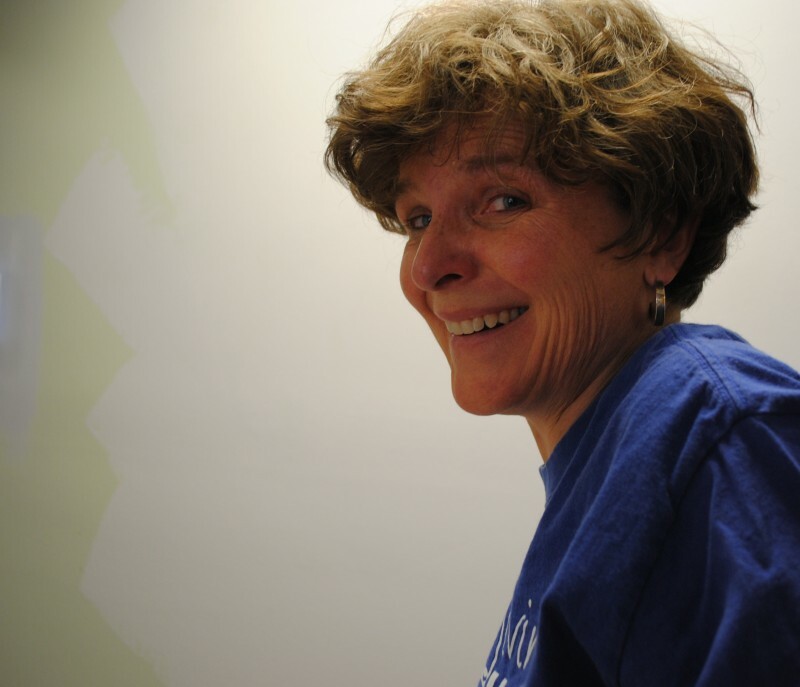 Susan Dykas hard at work! 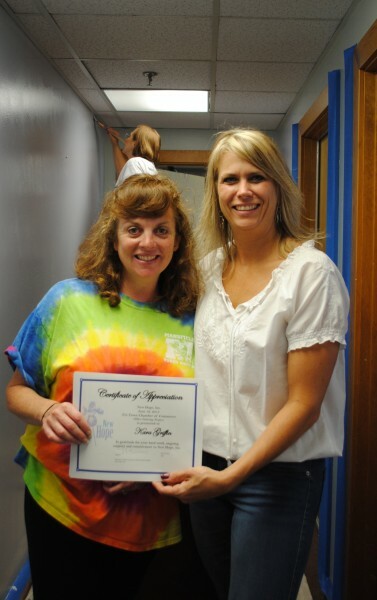 Kim presenting Kara with volunteer certificates. 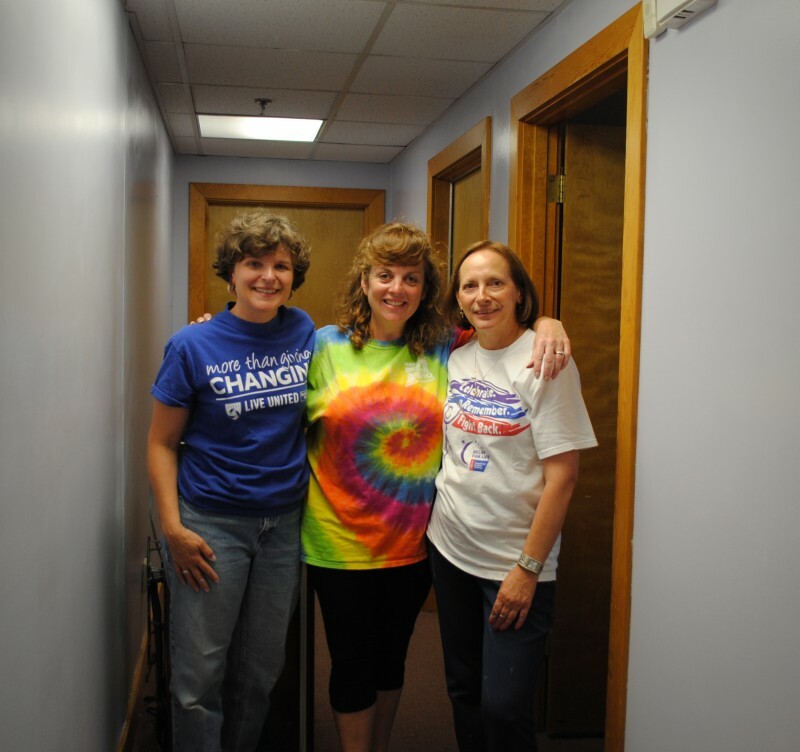 June 2013 - Business leaders from the Tri-Town Chamber of Commerce recently volunteered their time to repaint the administrative offices of New Hope in Attleboro as part of the Tri-Town Chamber’s Community Relations effort. 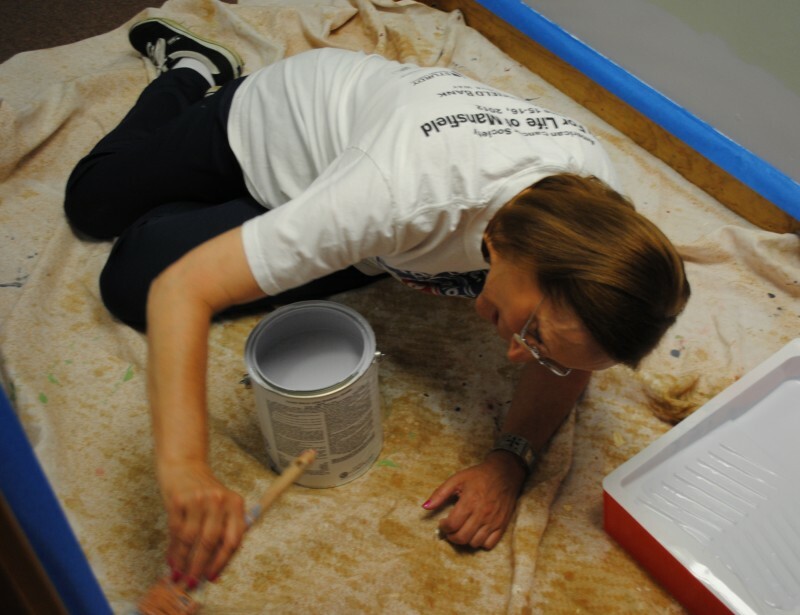 Utilizing paint donated by Tri-Town Chamber member Babel’s Paint & Decorating of Foxboro, the crew was able to spruce up the offices.